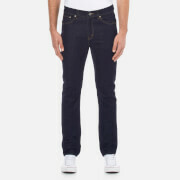 Men’s ‘Deam 30’ dark blue tapered fit jeans from BOSS Green. Crafted from textured cotton, the five pocket jeans are detailed with gun metal rivets, a metal logo tab on the coin pocket and tonal stitching. Complete with a top button closure and zip fly, belt loops and a logo embossed leather brand patch on the rear waistband. 98% Cotton, 2% Elastane Model is 185cm/6'1 and wears a size W32/L32. 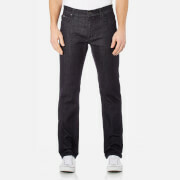 Men's slim fit jeans from Calvin Klein. 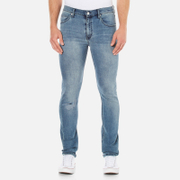 Cut from stretch denim with a sculpted design for ultimate comfort and movement, the medium rise jeans showcase a mid-blue wash and feature six pockets, a zip fly, and fading and whiskering throughout to create a well-worn aesthetic. Complete with signature loop stitching to the back pockets, and a branded leather patch to the rear waistband. Belt loops and branded hardware. 92% Cotton, 6% Elastomultiester, 2% Elastane. Model is 188cm/6'2 and wears a size W32/L32. 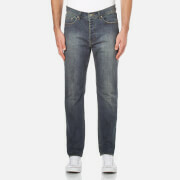 Men's slim fit jeans from Calvin Klein. Cut from stretch denim with a sculpted design for ultimate comfort and movement, the medium rise jeans showcase a jet black wash and feature six pockets, a zip fly, and fading and whiskering throughout to create a well-worn aesthetic. Complete with signature loop stitching to the back pockets, and a branded leather patch to the rear waistband. Belt loops and branded hardware. 91% Cotton, 7% Polyester, 2% Elastane. Model is 188cm/6'2 and wears a size W32/L32. 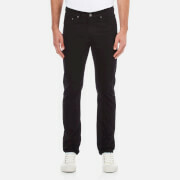 Men's skinny jeans from Cheap Monday. 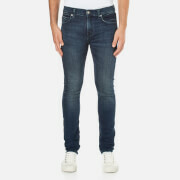 Cut from stretch denim with a tight fit and medium rise, the 'Tight' washed blue skinny jeans feature a concealed zip fly, slim legs and classic five pocket styling. Complete with whiskers and scrapings, steel finished rivets, and belt loops. Branded patch to the rear waistband. 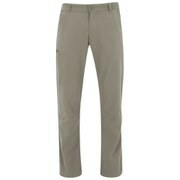 76% Cotton, 13% Viscose, 10% Polyester, 1% Elastane. Model is 188cm/6'2 and wears a size W32/L32. Men's slim fit jeans from Cheap Monday. Cut from stretch denim with a tight fit, the slim jeans feature a concealed zip fly, slim legs with a rip to the right knee, and classic five pocket styling. Complete with subtle fading to the thighs and a branded patch to the rear waistband. Belt loops. 84% Cotton, 14% Polyester, 2% Elastane. Model is 185cm/6'1 and wears a size W32/L32. 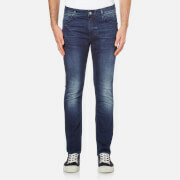 Men's blue washed jeans with a relaxed, tapered fit from Swedish brand Cheap Monday. Crafted from stretchy denim, the classic five pocket jeans feature a button fly, contrast orange stitching and branded silver-tone metal rivets. Complete with a leather brand patch to the rear waistband and belt loops. 98% Cotton, 2% Elastane Model is 185cm/6'1 and wears a size W32/L32.